Hello again everyone, I'm back. conditions. I thought i would give a quick update. 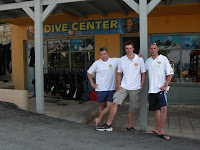 Peter finished his Divemaster exam today, he got a final overall score of 96%, a very respectable score might i add. We have spent most of the day doing shop work, repairing equipment, paperwork, administration stuff, checking stock etc. Basic shop stuff really. Might be bad weather for introductions but not for a hardened scotsman like myself..
Peter - "Iain, there is only 5 meter vis...."
Iain - "Thats 4 more than i need"
And off we go! It was a truly epic dive. Brings me back to my days with Aquatron down at Loch Long. So I Really Forgot About This..
Its time to make up for it! So whats new, well. I am currently working in Greece at Dive Creta Maris, a dive center based in the very busy are of Herssonisos - Crete. I have been here since May 1st and i leave on October 23rd. So far its been a very educational journey for me. I have two new Dive master Interns, well. I Did, they are pretty much finished now, i only need to do a few more things and they are ready to go. Its been a strange season here, busy, slow, busy, slow. Its very unpredictable. So i am still working as a Diving Instructor in awesomely warm places. I recently got my Upgrade to MSDT as well - so i am very happy about that. Well, thats all i have time for right now. Until the next time interweb. I forgot to update this blogger mcjobber thingy so im going to do a bunch of it now. My Divemaster intern and I hopped into the pool and done both a DSD and a Scuba Review, woop woop! Both of those were really good, Sam done very well hitting all the points he needed to and getting another two things ticked off his to do list. Hmmm, what else have we done. A-ha! We have also completed his Kit Exchange. Sam and Neil done the exercise together and i have to say i was very impressed. Sam scored a very good five! So, Thats a brief catch-up of what i have been up to other the last few days. Well well well it's DSD Monday! I had 2 DSD's today, well. After the Medical Form was completed i had one DSD...B.ut thats just the way it goes i guess. So, Me and Andy, Andy and I went in the pool and cracked on with the skills. He is very confident in the water, all of the skills were awesome, i was so chuffed - he seemed to be too. After a brief session in the pool we went out to Open Water - The House Reef. It was a rather strange day on the reef, lots of life. But terrible vis. However, despite this Andy and I cracked on and made the most of it. All and all it was a good dive! I also learned some new french from our new Dive Master Intern Manon, Woop Woop! A Quick update of the last few days. I have been quite busy the last few days at the dive center, Sam and i jumped into the pool and done a scuba review to see how his skills are - which are very good may i say. I have been busy with guiding dives this morning i went on a dive on the house reef with Robert (a client in the dive center) he is from Aberdeen so we had a nice little chat about cold water diving and about the lovely piece of kit that is, Drysuits. I have had some good news awsell. I applied for a job as a Instructor in Honduras last month and they got back to me today telling me i was accepted, so i am very happy about that. I am currently looking at flights to Utila now. They work in conjunction with Operation Wallacea, my duties will be Instructing, Guiding and conducting Underwater Clean-ups. 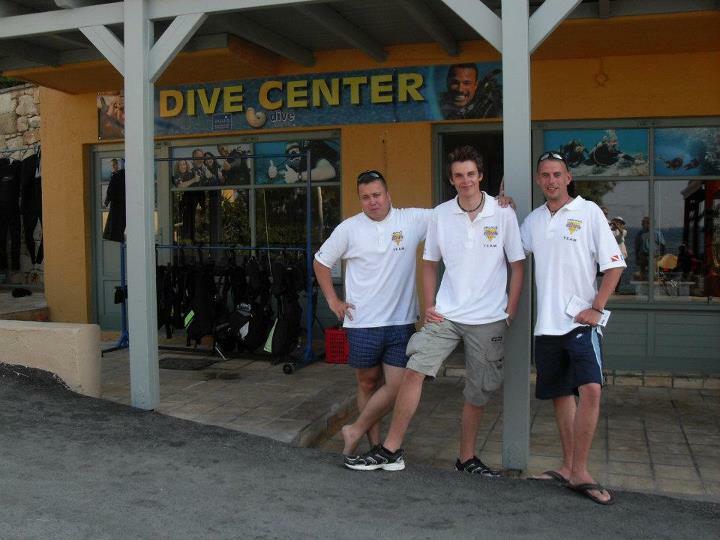 It turns out that an 18 year old instructor can get hired in this big world of diving!! xD, Truth be told i was getting alittle disheartened by the rejections i have been getting, but this response really has been the highlight of the last few months =]. Its gonna be tough living out there.... ha! My Most Educational And Nervous Day Ever! Well, i woke up today and i have to say. I was really excited. Today i done my first Rescue Diver Course. I spent a day before planning out how i would do it, but once the moment came, well... Yeah. That plan didnt work to its expected degree. I was really nervous when i got in the pool, i tried not to let it show, but i think it did shine through quite a bit. I have to say i has to be the most nerve wracking thing i have done in a while, but i had so much fun. For me doing my Rescue Diver Course was my most benficial and favoured course, i remember my Instructor Ally (Back in Glasgow) teaching my, i kind of molded both my current boss's style with his. It seemed to work well. There was a few times when i asked my boss for help, which is okay, i am never shy to ask when i need it. But i think she understood it was new to me, She is lovely though. So, after all the splashing and atacking of rescuers who got that little bit too close (Much to Melinda's delight) the pool session was over. Bang on! From here we all made our way back to the Dive Resort were "Not The Boss" was getting ready for a boat dive. I thought to myself, great. I can just sit down and chill out and collect myself. Then ofcoure, i get my next course. My first EF|R course! 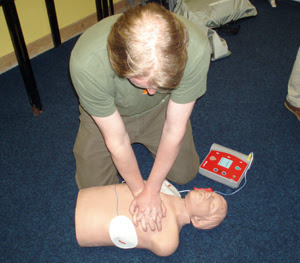 I was still nervous from the rescue diver course and i had began doing the EFR with trembling hands. So, i composed myself and cracked on. I have to say, i was dredding today... But i can honestly say this day has been one of my funnest days in my diving career so far. And i can't wait until the next one. Thank you "
Boss" and "Not The Boss" for one of my favourite days with Amarilla Divers - even if i didnt say it to you. Its been ... Educational. Diver 18 Signing out after a great day!! Advanced Course and Scuba Diver!! So, i have had a busy day! I was up at 8:15 awoken to a really cold morning! 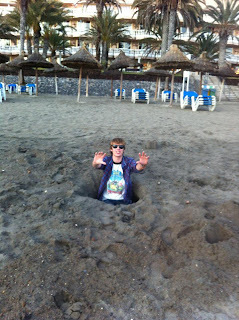 Its Tenerife, and its cold! Its just not fair.. However, i was struck by a beautiful sight as i walked out my front door. A perfect view of the mountain covered in snow! It was amazing. I was in the Dive Center for 9 and i was straight back into the Scuba Diver course, (which i strarted yesterday) OW Dive 2 on the House reef, Bang on! Everything was ace, skills were good, nice life. Some beautiful Cuttlefish, Octopus and Blue Damsels... Usual suspects really. Got out and finished off the rest of the paperwork, got a photo and boom, Jobs a good'un! 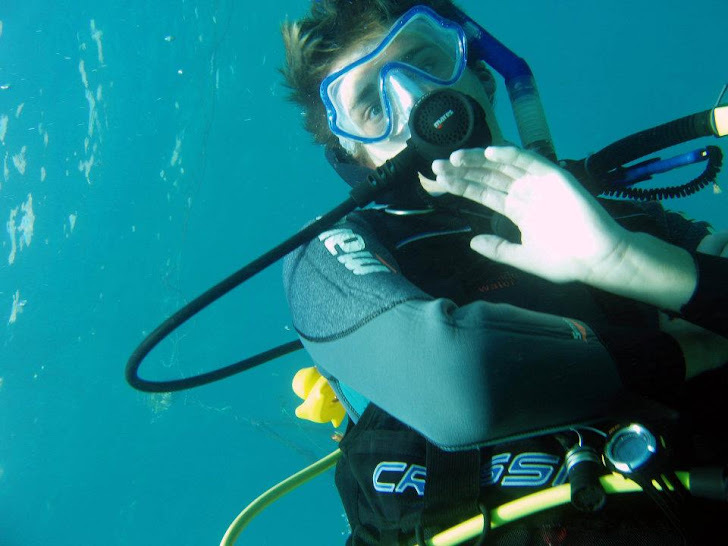 Sam got his Advanced Open Water Course done, so he is now Advanced trained. So yeah, He got his temp card today with a epic photo, he looks like a Llama... just sayin'. Oooh! Last night i done a Night Dive on the Wall, it was really nice, a bit cold but nice. Sam, Dannii, ( the other Dive Master Intern) Mark and I all went out. Vis was okay, life was good and there was a nice bit of banter afterwards, chilled out in the shop after. 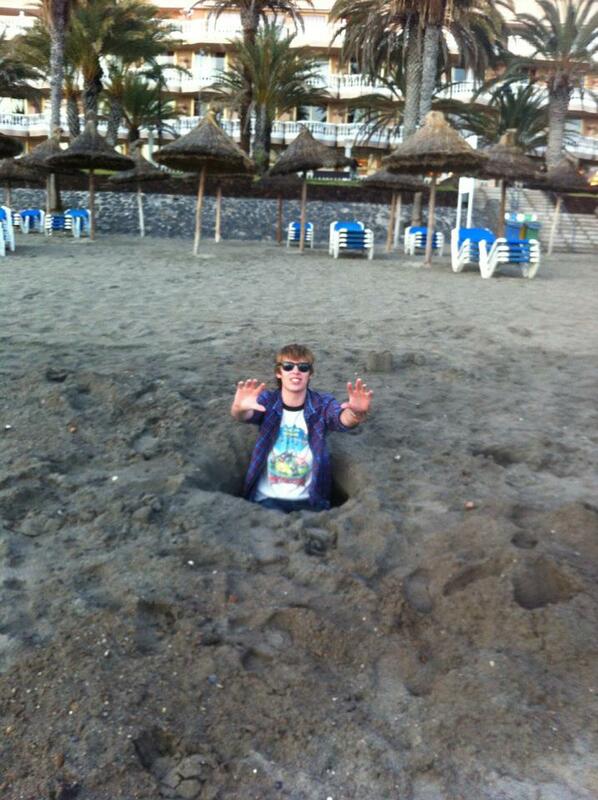 Went out for a drive with Dannii and Sam down to Los Cristianos we walked along the beach, watched the sun set.. jumped in holes... (Yeah, i'll back up there) We actually did.. dont believe me? I can't think of anything else to add now, thats pretty much you could up on my life over the last few days. Oh! I have a cold now, so my ears are playing up, might not be able to dive for a while :/ Sad times.. I would like to apologise for the weird paragraph lay out, it wont let me edit it, sorry.